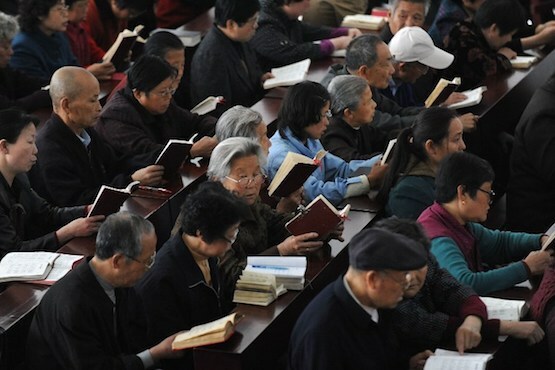 As China Pledges to Protect Religious Freedom, Bibles Vanish From Online Retailers | Have Ye Not Read? The above news story goes hand-in-hand with a news story from a few weeks back explaining that the Chinese government was busy shuttering the doors of Christian churches. In one case, they actually used dynamite to blow up a Christian church, as an example to Chinese Christians of what will happen if they keep studying God’s Word. Listen, all governments lie, and say they’re doing one thing while actually doing the polar opposite of what they claim. So it should come as no surprise whatsoever that the government of China “pledges to protect religious freedom” while removing Bibles from store shelves and blowing up churches with dynamite. I remember watching a short YouTube video last year of a small Chinese home church group receiving a shipment of Bibles smuggled in from abroad. The Chinese Christians were literally weeping for joy over getting the large box full of Bibles. I posted the video at the time, and commented that if only western Christians were as enthused about their Bibles as the Chinese Christians, we might be able to turn things around in this country. But western Christians are actually “churchians,” which is to say, mere church attendees. They rarely crack open a Bible and study God’s Word with any depth whatsoever. They’ve memorized John 3:16 and maybe…maybe…maybe Psalms 23. And that’s about the extent of their Bible knowledge. Yet they pat themselves on the back for that, as if it were a major accomplishment for God. Most Christians today, at, say, age 65, don’t know any more about God’s Word than they did at age 15. Indeed, all that most Christians today really know are religious traditions. They think “worship” is constituted by warming a pew for an hour every Sunday while the preacher teaches his typical sermon on “What’s wrong with the youth of today.” And then everyone rushes home to catch the big sports game on TV for the rest of the afternoon and evening. Hallelujah, right? But the word “worship” is a contraction of two words, i.e., “worth” and “ship.” And it means this: Through your attention to something, you demonstrate its worth and value to you. Putting your spiritual attention on attending church services but not studying what the Word of God actually says, means that you “worth-ship” church attendance more than you “worth-ship” the Word of God. When Christ taught the disciples to pray “Give us this day our daily bread” He was not teaching the disciples to pray for their daily food. You’re supposed to work for that. Not pray for it. Instead, He was emphasizing the fact that only God can give you your spiritual sustenance, through the power of the Holy Spirit of Understanding. And He was further emphasizing the fact that the Holy Spirit of Understanding only comes to those who sincerely partake of God’s Word by studying it on a daily basis, and asking God to help you understand it each time you partake of it through study. After all, The Bible – from start to finish — is simply the written record of Christ and His battle against Satan to save His children. And Christ is both the Bread of Life (John 6:51) and the Living Word of God (John 1:1; 1:14). They’re one in the same. Your “daily bread” is supposed to be the Word of God, which is that written record of Christ. Point being, the Chinese Christians find the Word of God itself worth focusing the bulk of their attention on. For the most part, they show “worth-ship” to the Word itself, rather than to religious traditions. They don’t “play church.” They study God’s Word in church. To the Chinese Christians, church is merely a platform for discussing and learning what the Word of God actually says. They believe salvation comes through the Word itself, not from some church, or some church tradition. That’s why the Chinese government is removing Bibles from the book stores, and closing down Christian churches there. The Chinese Christians take God’s Word very seriously. And why would the Chinese government want to crack down on access to Bibles and on churches that teach directly from the Bible? Well, there are some pretty revolutionary ideas in the Word of God. And if you really study it with understanding, you’ll come to learn that most governments of this world – if not all – are operating under Satan’s control. Yet most western Christians today don’t even grasp the fact that Satan is the “god of this world”? Yet it’s right there in 2 Corinthians 4:4. His wicked spirit quite literally permeates this world, and directs many if not most of its leaders, which explains why world conditions only get worse, and never better. Did you realize that Christ does not become the God of this world until directly after the sound of the seventh trump at the very end of this flesh age? It’s right there in Revelation 11:15. But most Christians think Christ is the God of this world today. They could not be more wrong. What this means, for Christians who actually care, is that in our relatively short stay on this earth in the flesh, we’re actually operating behind enemy lines. And the Bible – the Word of God — explains how to do so effectively and successfully. The governments of this world don’t want you knowing that. Nor do the western Christian churches, since for the most part they’ve become part of the system. Fortunately for the governments and the churches, most Christians are too enamored with the world and its substance to seek out and understand their marching orders from God’s Word. If you tell a typical Christian today that it’s his or her duty on this earth to work to disrupt Satan’s plans to send God’s children into the lake of fire to be destroyed eternally, and to help institute God’s Plan to save them eternally, they look at you like you’re in some kind of cult. The governments of this world, the vast majority of which operate under Satan’s spirit, and not God’s Holy Spirit, don’t really want their Christian citizens discovering Bible truths. And for the most part the churches go along with it, teaching mere religious traditions that have absolutely nothing to do with the battle for salvation through the Word of God. Mar 7:6 He answered and said unto them, Well hath Esaias prophesied of you hypocrites, as it is written, This people honoureth me with their lips, but their heart is far from me. Mar 7:7 Howbeit in vain do they worship me, teaching for doctrines the commandments of men. Mar 7:8 For laying aside the commandment of God, ye hold the tradition of men, as the washing of pots and cups: and many other such like things ye do. The churches are more interested in teaching and implementing empty religious traditions than they are in teaching the Word of God. That’s the bottom line. And that’s why I started the Bible study website at www.HaveYeNotRead.com – the goal of which is to draw Christians back into the Word of God so they can see what they’ve been missing. If you’re interested in learning what the Word of God actually says, consider opting in at www.HaveYeNotRead.com. Doing so will give you instant access to the in-depth Bible study “The Four Parts of God’s Plan,” as well as instant access to some 35 more in-depth Bible studies that are pretty much guaranteed to blow your mind.